Do I need to become a Buddhist to learn meditation? Not at all. Meditation is practiced by people of all religions or no religion at all. You need very little to start meditating, just a comfortable, quiet place to sit. Many people do decide to buy a few bits and pieces to help them such as a meditation cushion (or zafu), a yoga mat, some foam blocks or even a meditation stool. But all you really need is yourself. We teach two types – the mindfulness of breathing and the loving kindness or metta bhavana. There is a more detailed description of our main mediation practices on our meditation page. It is far better to meditate little and often than to have a giant meditation splurge once in a blue moon. When you have just started, aim to meditate for 20 minutes a day, on 5 or 6 days each week. If you can manage this, then you’ve got a good foundation. If you can’t manage this, then do what you can. A little is better than nothing at all. Do I need to learn meditation at a class? It isn’t absolutely necessary to attend a newcomers’ class to start to meditate. You could, in theory, learn from books, tapes or websites. In practice, most people find attending a class or two to be a good way to start a regular meditation practice. Leeds Buddhist Centre offers a number of different classes in both the daytime and the evening. Why do people meditate as part of a group? Regular meditators find coming together as a group on a regular basis very supportive and motivating. It is an opportunity to share experiences and perhaps to learn from people more experienced than oneself. 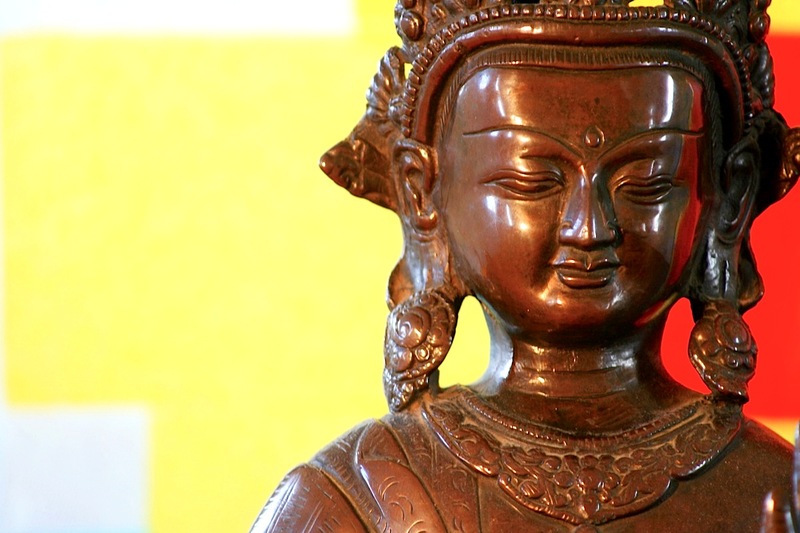 Leeds Buddhist Centre offers many opportunities for meditation as part of a group. Do I need to sit in an uncomfortable crossed legged position? No. The important thing is to be comfortable. The right position is the one that is most comfortable for you. Some people sit on the cushion in the full or half-lotus but most just sit cross-legged, or kneel. Others prefer to use a chair. Some people even lie down. Isn’t meditation just about emptying the mind? Not really. A part of meditation is certainly about calming the mind and there may be points when thoughts do diminish. But meditation is about bringing a kindly awareness to our present experience, whatever that may be. A retreat is a longer period of meditation practice often combined with elements of Buddhist teaching. A retreat can be as short as a day or as long as a month or more. Leeds Buddhist Centre holds many day and weekend retreats and there are a number of Buddhist retreat centres around the country that offer longer retreats.